VW will launch its first three I.D. electric models starting in 2020. Shown, from left, are the I.D. Buzz minivan, I.D. hatchback and I.D. Crozz SUV. WOLFSBURG -- Volkswagen Group's core VW brand said costs for its electric-car program, along with EU requirements on curbing emissions and other climate-related demands would cause profitability to stall between 2018 and 2020. Profits would be hit even as earnings, sales and deliveries at the automaker were forecast to hit new records this year, VW brand executives told a media briefing at its global headquarters here on Wednesday. The VW brand shoulders the bulk of VW Group's development spending, as well as costs related to its diesel emissions-cheating scandal. VW finance chief Arno Antlitz said the company faced "heavy financial demands" due to bottlenecks expected from introducing so-called WLTP lab tests related to car emissions and fuel consumption, regulations to curb CO2 emissions and EV development costs. "The CO2 fleet targets will certainly pose the greatest challenge for us as a company until the year 2020," VW brand CEO Herbert Diess said. 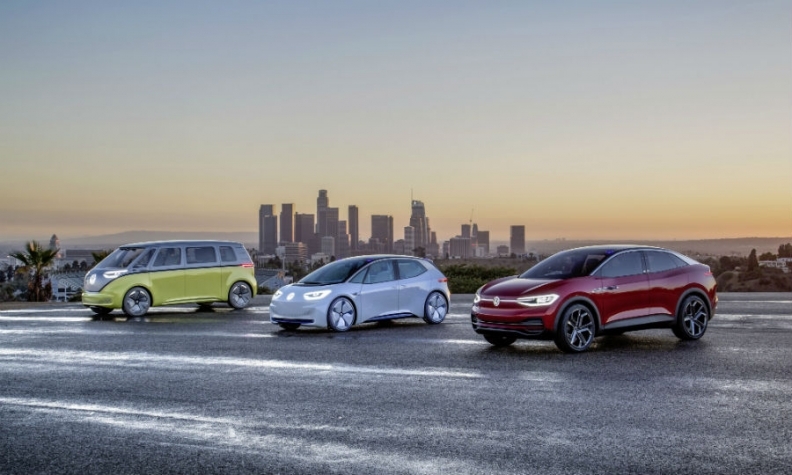 Starting next year, the group will roll out a new EV "virtually every month" to eventually offer the largest fleet of electric vehicles in the world, VW Group CEO Matthias Mueller said at the company's annual press conference on Tuesday. Last year, VW brand, the group's largest division by sales and revenue, more than doubled its return on sales to 4.1 percent on the back of cuts in research and development spending, lower production costs and rising sales of SUVs, which deliver higher margins. "This year and over the next few years, the brand will face severe challenges despite its improved competitiveness," VW said in a statement. But Diess said VW expected to benefit from further cost savings, expansion of modular production and growing demand for its new vehicle models in North and South America.